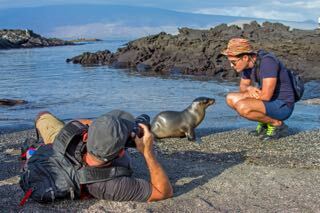 Cruise the Galapagos islands, climb volcanoes, raft spectacular rivers, hike and trek through cloud forests and paramo landscapes, bike through amazing countryside, or explore Ecuador's historic cities and points of interest...just some of the ways to enjoy the incredible biodiversity, sceneries and cultures Ecuador offers to its visitors. Eos Ecuador specialises in planning custom tours for our clients based on their specific interests and preferences, offering complete and responsible travel services throughout Ecuador. From the amazing Galapagos to the unique diversity of the Amazon rainforests, we select top quality, responsible providers, emphasising those with a high level of social and environmental responsibility. Further, as part of our promise of responsibility, we commit to donate a portion of any profits we earn to projects or organizations dedicated to sustainable development in Ecuador. Experience Ecuador with us; return from your trip with much more than a collection of photos. We hope you enjoy browsing through our site. Please feel free to contact us if you would like more information on our offerings.